Apparel manufacturing has been dying a slow death in the US for decades, with the surviving companies usually relying on big military contracts. But two guys from the Merrimack Valley hope to break the mold. 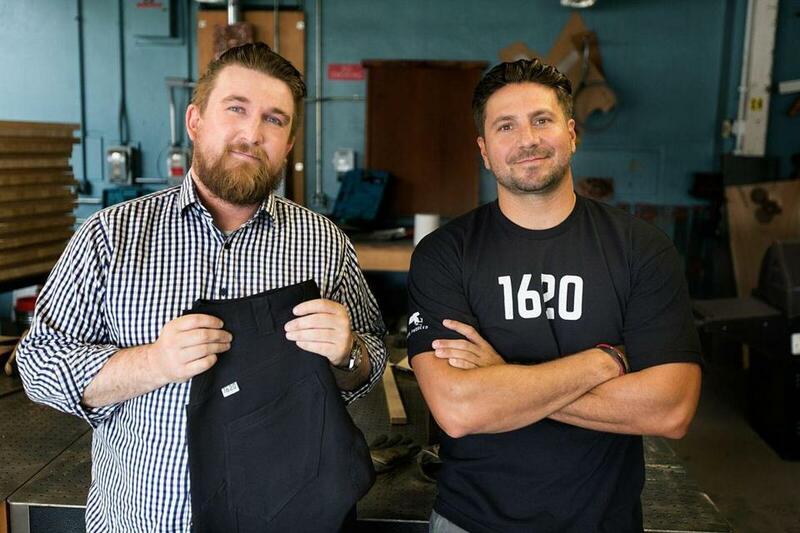 Josh Walker and Ted De Innocentis have launched a workwear company that sells only US-made clothing, with a supply chain that includes several Massachusetts manufacturers. They started selling directly to consumers last fall, under the name 1620 Workwear Inc., and moved into their first office in Haverhill in late July. Their big bet: men with blue-collar jobs will be willing to pay more for their garb, with the understanding that the clothes will be far more durable and comfortable than standard-issue shirts and pants. After all, 1620’s products don’t come cheap: a pair of pants can retail for $198, and a work shirt, for $128. Big companies have noticed the niche: VF Corp. and Patagonia are investing heavily in workwear. But the two friends believe they can outflank these rivals by focusing on quality. Among the components they use: high-end stretchable fabrics made by Tweave in Norton. For a smaller orders, Walker says it’s cheaper and more efficient to manufacture domestically than in China. It’s been tough at times convincing domestic manufacturers to take on their smaller jobs. That’s changing, he says, as 1620 establishes a track record. They envision a day when all their clothes are made in Massachusetts, and they’ve already talked with state officials about financial assistance that might be available. They picked a name to highlight their ambitions: honoring the entrepreneurial spirit that launched a nation. Now, they’ll get the opportunity to live up to that lofty goal.